Slice the onion and cook it in a pan with butter to brown for about 25 minutes. Meanwhile, mix the stock and cream and microwave for 2 minutes. When warm, whisk in the potato flakes. Open the green bean packages and add them to the slow cooker. When the onions are brown, toss the mushrooms into the pan and stir, cooking for about 3 more minutes. Add the onion mix to the slow cooker and then stir in the cream mixture. Cook on high for 4 hours. Top with onion straws and serve. To make this vegetarian you can substitute veggie stock for the chicken stock. 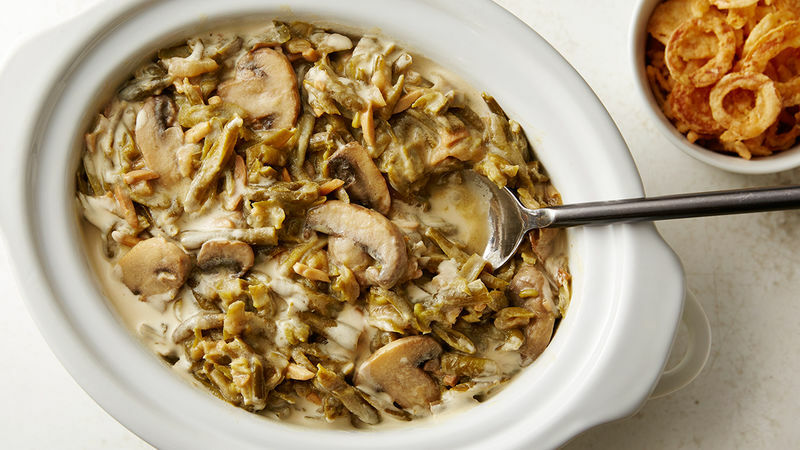 Enjoy green bean casserole with a few shortcuts – but the same classic taste! Green bean casserole has been a holiday side dish staple for years and years, but suddenly in this modern age of cooking it has become a little controversial. Most of the controversy comes from using the most common shortcut, cream of mushroom soup. I set out to make a from scratch version that took some unique shortcuts but was still homemade. You can take this green bean casserole to your next holiday party and be really proud of the dish – but also not have to spend hours over the stove. The main time-consuming step of this dish is browning the onions. Honestly though, green bean casserole is not green bean casserole without them so it’s an essential step. Once the onion is brown, add in the mushrooms and toss just to soften. The super shortcut that makes this casserole thick and not watery is whisking some potato flakes into the cream and stock mixture. Sliced green beans help save some time too. The sauce is poured over the beans, onions, and mushrooms. To serve, top with onion straws and just stick a spoon right into the slow cooker! Creamy and savory, with a little crunch. The beans still have some texture as well. Tastes like holidays! Dan Whalen didn’t like green bean casserole until recently. He has been blogging for over 6 years at The Food in My Beard; check Dan's Tablespoon profile often to try his recipes with creative international spins!